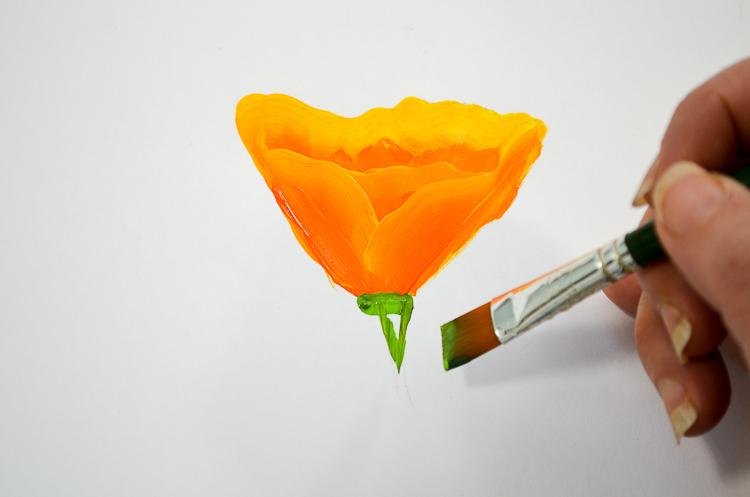 How to Paint California Poppies, the state flower of California. Simple, one stroke at a time instructions with video. Step by step for beginners and experienced painters alike. 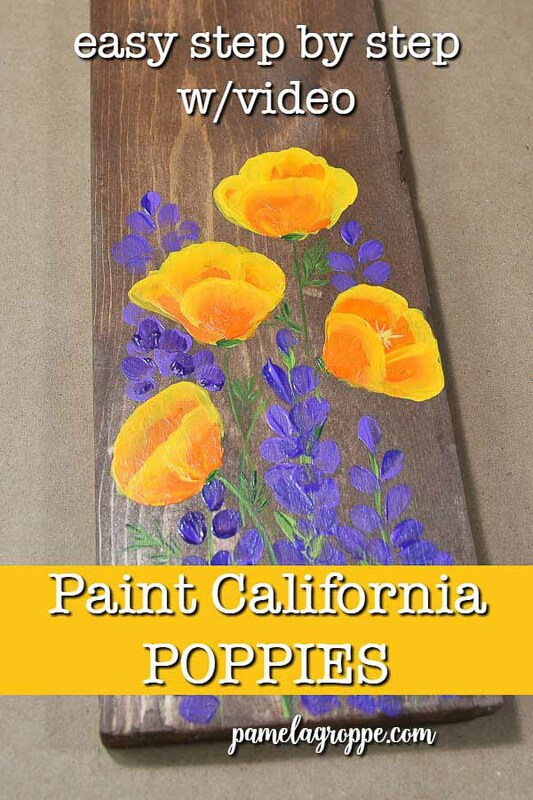 Come paint California poppies with me. 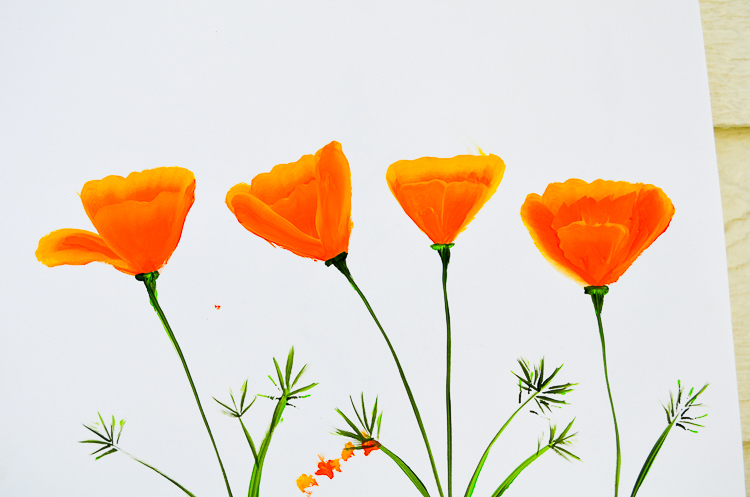 California poppies explode into bloom all over the county in Spring. They are so abundant in places that it looks like fields of orange and what a sight it can be. The bright cheerful orange and yellow need to be painted! These would pair well with the Texas Bluebonnets post I added recently! I will include a link at the end of this post so you can check that out later. You would think they would be easy but it took me awhile to get the method down to where beginner painters could master it in no time. I confess, I gave up on the leaves. I need to practice those until I find a method that I like but in the interim we will be content with the flowers grabbing our attention so effectively that we won’t notice the leaves. Agreed? At the end of this post I also have a video of me painting a few different ones so you can see how to mix it up to get a variety of flowers. 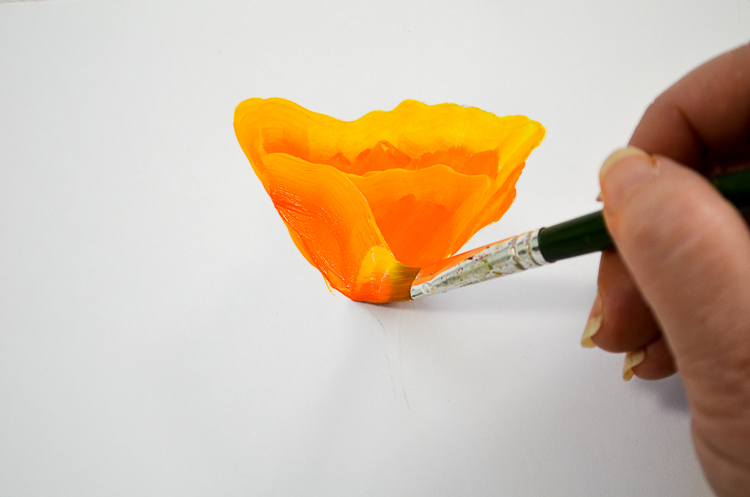 Start with drawing a V with the chisel edge of the brush then make a long wiggle stroke along the top edge of my poppy. The yellow is on the top. 2. 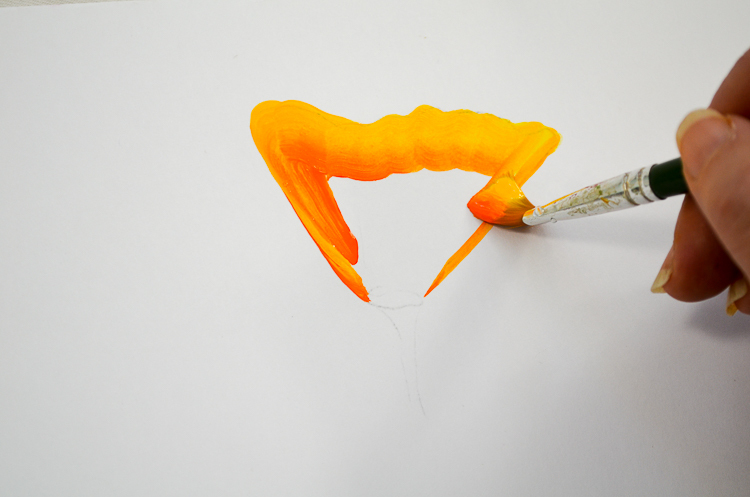 Fill in the lower section with the corner of the brush that has orange on it. If you get some of the yellow streaking in as well that is all good. Just as long as the orange is the dominant color. 3. Let it dry some as you want the next stroke to have some definite contrast. If you start the next petal too soon it may blend in too much. 4. Again with the yellow to the top do another long wiggle stroke lower on the flower and this will be your front petal or petals. 5. Then do another coming down from the other side. This creates a more open poppy. 6. Double load your brush (not on the corners just dip in both colors, I show you in the video exactly what I mean) with your lighter and darker green colors. 7. 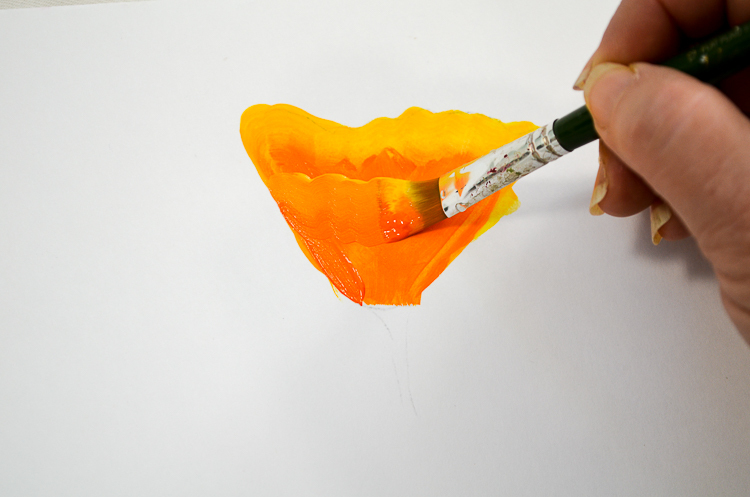 Press the chisel edge of your brush right at the base of your poppy to create a thickish line. 8. With the corner of your flat brush make a V shape under the thick line (more centered than mine) and fill it in. 9. Then drag your brush on the chisel edge to create a stem. I added a few chisel strokes on a stem for a leaf type shape but am not satisfied with it. 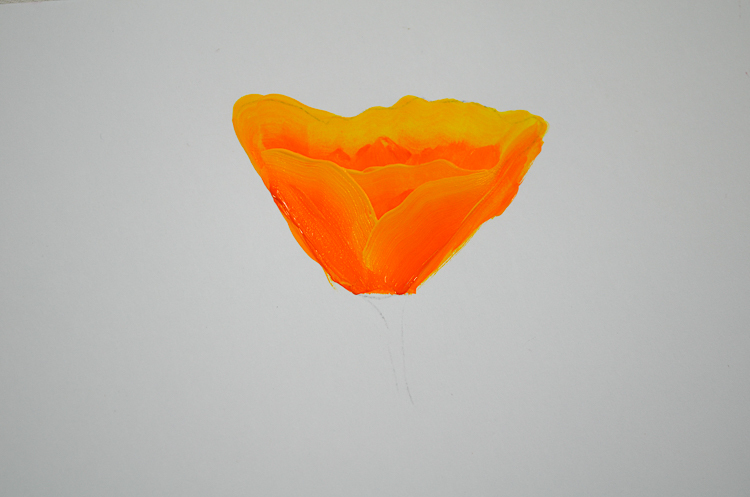 I am still practicing that and picked a poppy leaf set yesterday, photographed the heck out of it and now I am going to study it with paint brush in hand and see if I can mimic it better. I don’t go for complete reality but I would like it to actually resemble a real poppy leaf. I know you will enjoy the video even more. Most of these supplies should also be available at your local hobby/craft store. I wish you happy Painting! Very interesting, Pamela. I think the video and the instructions are great. I was enthralled to watch you create depth and dimension with two colors. Very good. I learned a lot from one video. I told you that I took rosemaling classes once so I am familiar with the technique, but I have to say this looks like one heck of a lot more fun. Nice to hear from you again Ginene. I do enjoy that about this method of painting and the more you play around with it you can develop some neat skills. I have a book on the Zhostovo method, it looks so easy and yet it is not! You are most welcome Susan. It felt so summery yesterday, it was wonderful at over 70 degrees F. I reveled in it! 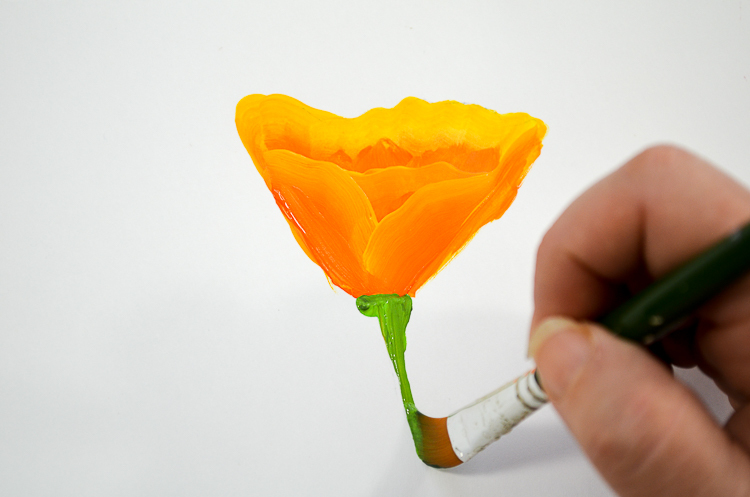 I am working on the workshop for painting poppies on glass. It is a little different but turns out just as gorgeous. 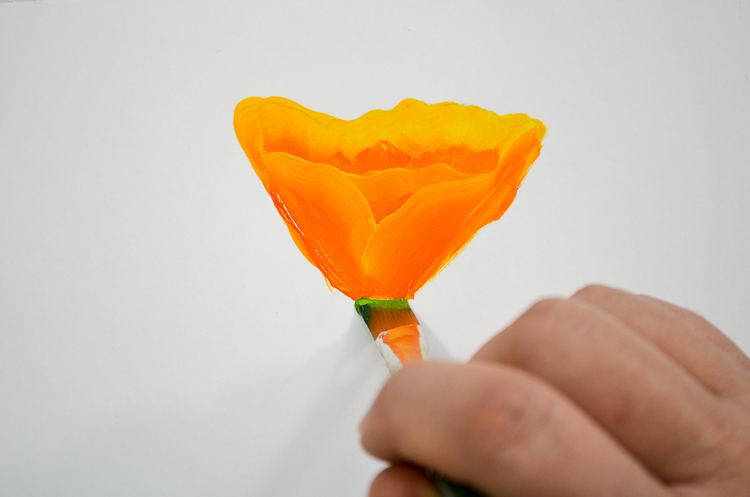 I am working on painting poppies on glass. I’m doing a six panel window and having a difficult time. Do you mean a video on painting poppies on glass? I could do that. Let me put it on my schedule. Now you are really getting me inspired to get my paints out and play! Thank you Ang. I do enjoy sharing my tutorials. Pamela, I love your paintings. Your video’s and written instructions are very easy to follow. It there a way to print off the written instructions so I can take them with me? I can’t always bring my computer with me. Thank you. I am working on an ebook as we speak. It will have a collection of my tutorials in PDF format so you can download and print easily. Hi Pamela, I just happened to find you today while browsing. I love your teaching method . I have tried another method of One Stroke Painting, but couldn’t get the feel of it and was frustrated. Your way is easy to follow and has a calming effect. Do you use watercolor paper for your paintings? Thank you very much. I just started using watercolor paper for some of my tutorials as the paint flows so well from the brush onto it. I paint on all sorts of surfaces. One of my favorites is wood. I also paint on stretched canvas.